I am back from Malaysia! I had the most amazing time and did some incredible things (holiday blog post coming soon!). While I was in Kuala Lumpur, I had a sneaky visit to Sephora. Sephora has only recently opened in Australia, which means that we have gone a long time without many of the cult beauty brands. So, I made the most of the cheaper prices and was #feelingspendy. I had an idea about what I wanted and I came out feeling quite happy with my purchases. I also did a bit of duty free shopping and got a few MAC bits and bobs. I am so in love with the Naked 2 palette I can't even describe my joy! I have been waiting for so long for this palette and am super impressed with the shades. It took me a while to decide which naked palette to buy but I am happy with Naked 2. The shades are super pigmented and great quality (as we all know) and are really versatile for day and night looks. The MAC eyelash curler has probably changed my life. I have never owned eyelash curlers before and always thought they were a bit of a gimmick. But wow, I think this will be one step in my makeup routine I will always include! Curly lashes all the way! I also bought a beautiful Ted Baker bag to store all my makeup in! I can't wait to try out these products. Stay tuned for reviews of these products! The last two weeks have been insanely busy and I probably have experienced the best time in my life. I finished my degree at university, got offered a permanent teaching job and tomorrow I leave for an amazing trip to Malaysia. In the middle of all of this it was my birthday! I was lucky enough to get an exciting package of beautiful makeup brushes from my lovely boyfriend. I have been eyeing off the Zoeva Rose Gold Luxury Set for a while now and am happy to say that they are superb! This set comes with 8 essential brushes, for both face and eyes. The brushes are a combination of natural and synthetic hairs, making it easy to work with cream and powder products. This is a perfect starter kit for someone beginning their makeup collection. There is a range of brushes, each for an essential step in your makeup routine. The brushes come in a gorgeous brown clutch, which is a great bag to store your brushes or makeup for travelling. The rose gold design takes the cake. They are so stylish and looks great on my dressing table. One thing that I am loving as I am getting older (turning 23 in 2 weeks eeeeek) is being able to dress in a more sophisticated way and start developing my own style. I have a very relaxed, casual style but I love to experiment and change up my look every now and again. One fashion piece that I am obsessed with at the moment is the mid-length skirt. I think they look uber sophisticated, stylish and relaxed. They are great for day wear and can also be dressed up with accessories and a classic pair of heels. As a teacher, I need to be able to wear appropriate length skirts, so these skirts will also work as an excellent piece for work. 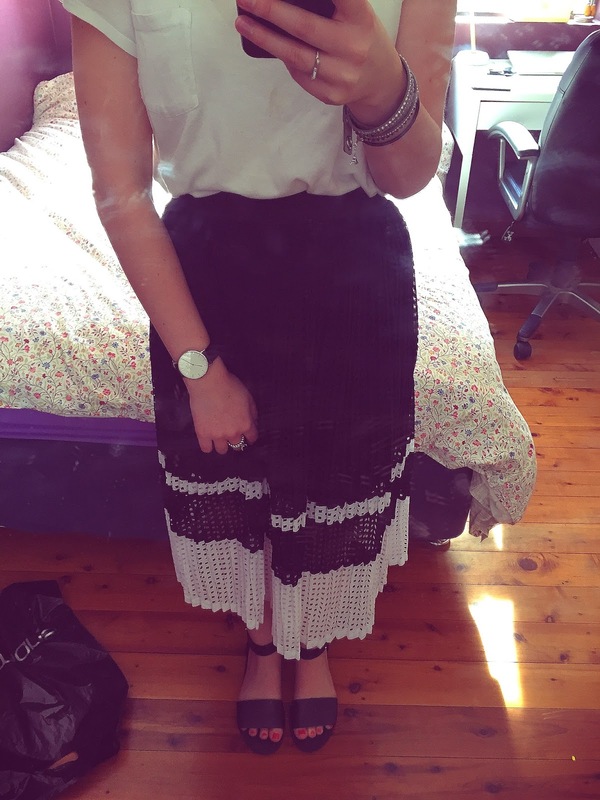 I am absolutely loving this monochrome mid-length skirt from Portmans. It is a gorgeous pleated cutout skirt with white panelling on the hem. As soon as I saw it and tried it on I fell in love. I love that it is monochrome as it is super easy to pair with a simple top and shoes. The skirt ends below my knees and has a comfortable elastic waistband. This is going to be a great piece I will wear all through Spring/Summer. Do you have a favourite fashion item this season? I have decided to do a series of Summer Edit posts, where I will feature a variety of outfits, beauty and lifestyle picks relating to my favourite season! I always think the best things happen in summer and some of the most memorable moments in my life are during the summertime. It is Spring here in Australia at the moment, but it is definitely warming up quickly. This outfit is based around a casual night out and I have included a long sleeve tee as it usually gets cooler as the sun goes down. I think stripes are the bees-knees! It can be casual but uber sophisticated at the same time. I have way too many striped tops to count, but my favourite is always a simple black and white stripe. I love pairing this with a pair of simple denim shorts. Denim shorts are a staple here in Australia, as they can be worn to the beach or even be dressed up for a night out. To be honest, I am always on the hunt for the perfect denim short. I recently purchased a great pair from Myer, from their Miss Shop range. The key is for them to be super comfortable and not too short! A simple strappy shoe is also an essential during this time of year. These shoes are from Windsor Smith and can be worn with just about anything. They also come in black and tan, which would also look great with this outfit. To complete this outfit, a black leather bracelet from Pandora would be perfect, along with a simple white bag from Topshop. This keeps the monochrome pattern and gives it a finishing touch. I love this minimal look at the moment and I think this is the best way to style during the Summer. Stay tuned for next week when I feature some great beauty products perfect for summer! I thought I would give a little insight into my phone and the apps that I use. I own the iPhone 6, which I have had for about a month. One thing I must have on my phone is a background image that motivates me. I am going camping when I am on holidays in a few months and this picture keeps reminding me of all the adventures that are about to come. I always need to have my apps organised into folders! I don't know if this is my OCD coming out but I think it looks so must neater and more organised! My most used apps are mainly my social media accounts: Instagram, Facebook and Twitter. I also love to go on Tumblr and of course keep up to date on blog posts using Bloglovin. For my picture editing, I use Whitagram, which helps to resize the images and create a white border. This is great to do before uploading to Instagram where it often cuts out part of the image. I also use Insta Shapes and VSCOcam to edit my pictures. I love playing around with photo editing apps and am always on the look out for some more! Let me know if you have any favourites. I also use Evernote and Dropbox, mainly for my university work. I love how these apps are synced through all my devices and can be used anywhere, anytime! This makes life a lot easier when you are in a rush to catch the next train for class! I recently downloaded the app Headspace, which is a meditation app. I have been feeling quite stressed at the moment, with university, finishing my degree and the worry of finding a job! It is also nice to try and find a moment in each day to sit quietly and try and forget about everything that is going on. So I am going to make a conscious effort to meditate and find my inner zen! Do you know of any meditation apps that are useful? Everyone has those items in their wardrobe, makeup collection or bathroom that they just cannot live without. Whether you are going out for the day or going camping for 5 nights, sometimes we need to use products to make us feel a bit more like ourselves. There are three items in my skincare collection that I am loving at the moment and I use on a daily basis! The first product is the Natio 'Lift' Skin Firming Serum. This is the first serum I have used, as I have always opted for a Rosehip Oil in my evening skincare. This has honestly done wonders to my skin. It claims to soften fine lines on the face, which I am not too worried about at my age now, but hopefully this acts as a preventative! It has made my skin glow, making it feel super soft and supple. I use this after I cleanse and before I moisturise day and night, to give added nourishment to my skin. There was one day where I didn't use this and my skin felt so dehydrated and lacklustre. This is definitely a product that will be in my skincare regime for a long time. The next product is deodorant, which is a product that is not commonly discussed in the beauty world. But hey, everyone wears it! For years I used to wear the Dove deodorants but recently I have switched over to the Rexona Biorythm Dry 48 hour deodorant. One word to encapsulate this deodorant is definitely 'dry'. It does exactly as it says and lasts the whole day. What more could you want? The last 'can't live without' product is the Nuxe Reve de Miel lip balm. I know I have raved about this already in one of my previous posts, but I love it. It is ultra moisturising and nourishing on the lips. My lips are always dry and chapped, so this little guy never leaves my side! What are your 'can't live without' products? If there is one thing I know how to do well, it is shopping. And of course I always have a few items that I have my eyes on. In the next few months I need to take is easy on my bank account, so this lust list will keep me dreaming! 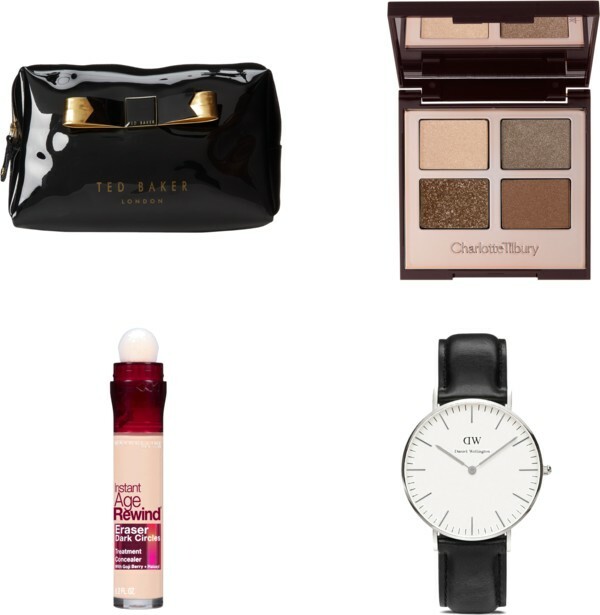 The first item is a Ted Baker makeup bag. I have seen a few YouTubers, such as Tanya Burr and Gabbi from Velvet Ghost, sporting these makeup bags and they look beautiful. These bags are so stylish and they come in a range of colours and patterns. They look super durable and great for travelling. The Charlotte Tilbury Luxury Palette looks incredible. The colours in this 'golden goddess' palette can take you from a day time to an evening look, which makes it wearable and versatile. The packaging is adorable too. I have been dying to try the Maybelline Instant Age Rewind Concealer for ages, but haven't got around to buying one. I need to address the major under eye dark circles that I have going on. Hopefully I can buy this soon and let you know how it goes! I have been seeing Daniel Wellington watches everywhere at the moment, and I am so excited because the store I work at will be selling these watches in a few weeks! This means I can add another watch to my collection (I may have an obsession!). I think I will opt for a sleek back band with the steel face, as I already have a rose gold watch. This seems like a great everyday watch, but it still has the oversized 'boyfriend' look. What items are on your lust list this month? I am an aspring blogger with an avid interest in fashion, beauty, travel and life.